Click on the Apple menu button, then go to System Preferences --> System Preferences --> Security and Privacy --> General. In the Allow apps downloaded from the section, if you're a beginner tick the App Store option to prevent the application from other sources from being installed. 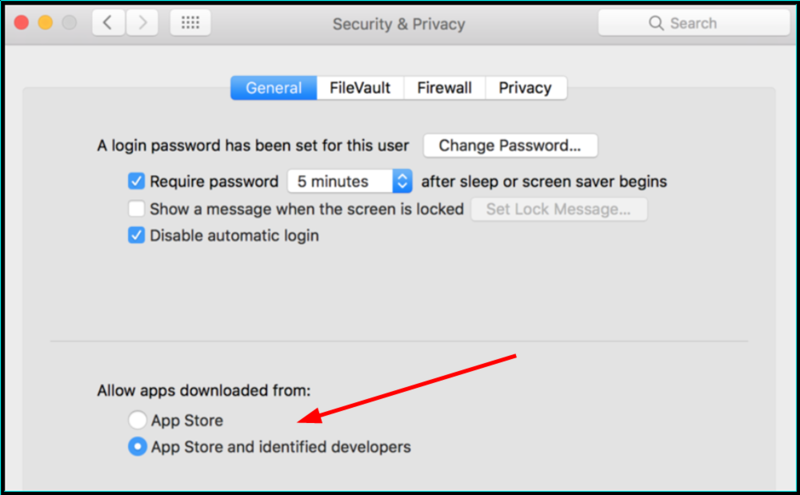 If you're a somewhat more experienced user, you can use the App Store and identified developers option to get a bit more leeway while still staying safe. One thing you should be aware of is that both Apple, as well as software developers, fix security issues as they are discovered. This means that each update or patch that's being released may contain fixes for vital vulnerabilities or other security flaws. This is why, it is highly recommended that you keep your operating system, drivers, as well as installed software, permanently updated. The more time you keep an older version installed, the more time you give attackers to exploit a known vulnerability. Firewalls are a very important part of your machine's security as their job is to block unauthorized incoming and outgoing connections. By default, the MacOS operating system comes with its own firewall and you should ensure that it's enabled by going to the Apple menu --> System Preferences --> Security & Privacy --> Firewall and clicking the Turn On Firewall button. Additionally, you can also install third-party tools such as Radio Silence or Noob Proof for extra security and options. These are just a few basic yet important ways of protecting your Mac from malware. Of course, all the security options and tools in the world cannot replace the human brain, so make sure that you carefully read everything before installing an app, visiting a website or opening an email. Now that you know how to keep yourself safe from malware, the question is: what was the most annoying malicious software you've had to deal with? Let us know in the comments below.